Perfect for uneven skin tone, congested skin, pigmentation and even acne. A thin layer of medical grade liquid carbon is applied to the skin, where it penetrates deep into the pores. The laser is then applied to the skin. 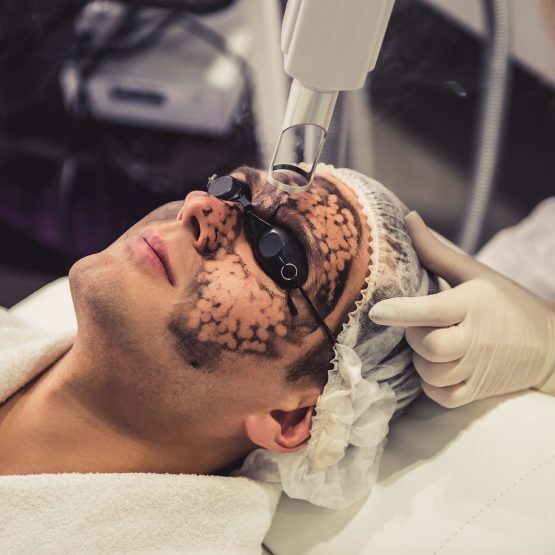 When the laser is passed over the area, it vaporizes the carbon, removing dead skin cells and the carbon from the depths of the pores, contaminants and oil with it. It takes a 15micron layer of skin off, leaving an amazing glow. There is no downtime following a Carbon laser facial peel with results appearing even following one session. A course of treatments are recommended depending your skin condition and desired results. We recommend spacing the treatments out every 2-3 weeks and we suggest a course of 3-6 treatments to get the best outcome. Side effects are minimal and there may be mild redness and a tingly feeling after the treatment, but they resolve within a few hours after treatment.